Lock in a great price for Core Luxury Suites – rated 8.9 by recent guests! 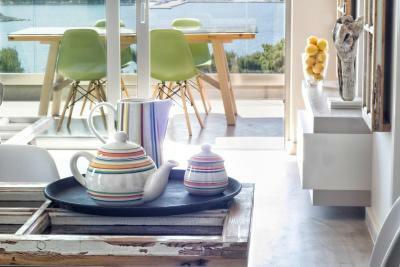 Everything was new from furniture to towels , stunning view, warm staff! The owners are great, kind, willing to assist with any issue, question and request. The location is very good: great view, quiet, close to the city. The place is new, clean and very good breakfast and service. The location was beautiful, Gregory was very helpful and treated us to a bottle of wine for our anniversary , will definitely be going back, best holiday ever. The owner / manager was exceptionally friendly and helpful, willing to go above ad beyond. We were made to feel welcome from the start. They helped us get the most out of the area, property and ensured we were comfortable and looked after. The accommodation was very well done, very clean and comfortable. The breakfast was amazing with lots of things from the garden. The location was wonderful. The building, the rooms, the design, the view where exceptional. We had a warm hospitality and the staff was very friendly. 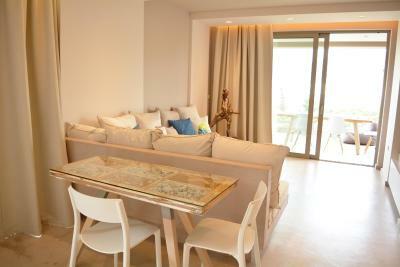 Everything ... mostly location, suite and view of Skiathos port !!! We had a perfect time during Easter and we enjoyed everything so much... 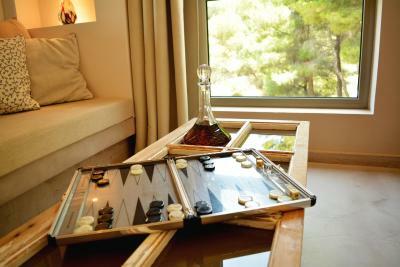 The suites are very near to Skiathos town located almost inside a forest near the sea !!! Congratulations to the owner for the decoration and suites design !!! It was the perfect location and perfect room. The whole Hotel is newly build or renovated. The view is amazing like everything else. Can highly recommend this place. Impressing panoramic view. Well designed and very comfortable suite. The location is TOP! Host is very warm, and rooms are SUPER spacey, comfy and new. One of the best rooms i ever booked! 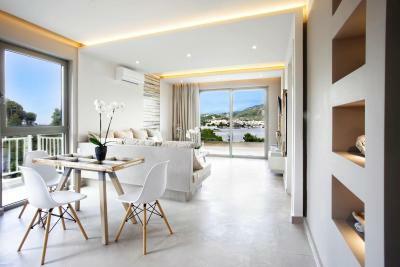 One of our top picks in Skiathos.Located in Skiathos Town in the Skiathos Region, 3.1 mi from Lalaria Beach, Core Luxury Suites features a sun terrace and views of the sea. Guests can enjoy the on-site restaurant. Free private parking is available on site. Each room at this guest house is air conditioned and features a flat-screen TV with satellite channels. Certain units have a seating area to relax in after a busy day. A terrace or balcony are featured in certain rooms. 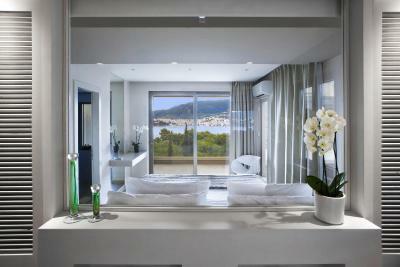 All rooms are equipped with a private bathroom. For your comfort, you will find bathrobes and slippers. Core Luxury Suites features free WiFi . 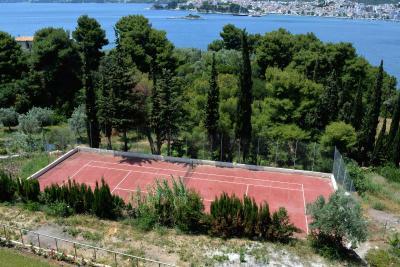 You can play tennis at this guest house, and the area is popular for horse riding. The guest house also offers bike hire. Papadiamantis' House and Skiathos' Port are almost 1.9 mi away. 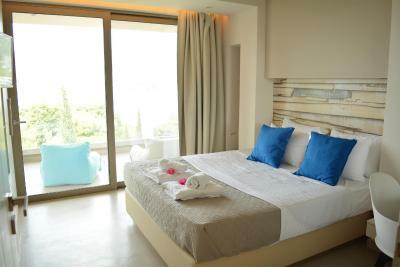 The nearest airport is Skiathos Airport, 1.2 mi from Core Luxury Suites. 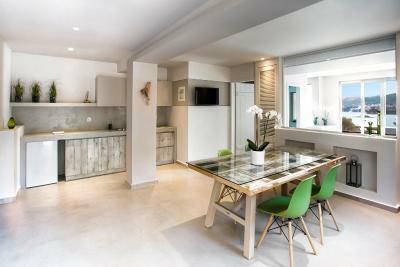 When would you like to stay at Core Luxury Suites? House Rules Core Luxury Suites takes special requests – add in the next step! Core Luxury Suites accepts these cards and reserves the right to temporarily hold an amount prior to arrival. Please inform Core Luxury Suites of your expected arrival time in advance. You can use the Special Requests box when booking, or contact the property directly using the contact details in your confirmation. With what you pay you expect a shuttle service to and from airport or port. Lack of personnel and service. The place is absolutely stunning. 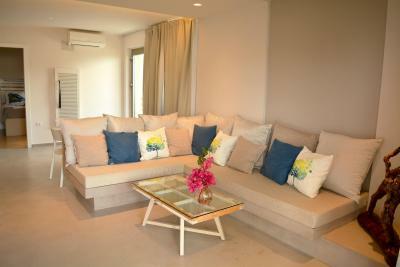 Rooms are beautifully decorated and comfortable , terrace was beautiful, the view also. Lovely breakfast. Wi-fi does not work in breakfast area. Breakfast is not standardized. One can immediately realize the management is with no experience even though very friendly. Beach towels are missing. The hotel was recently opened and many things were not ready or did not work as they should. Also, I find the lack of a pool very strange. At this location and to this price it should have been a minimum to ask for a pool rather than a tennis court that no one uses. I think this hotel is way overpriced given it's current situation. Once everything is ready and working as it should I guess they could charge as they do now. Staff are friendly and helps out as much as possible. However, the owners were a bit disorganised and things did not always work out as expected. 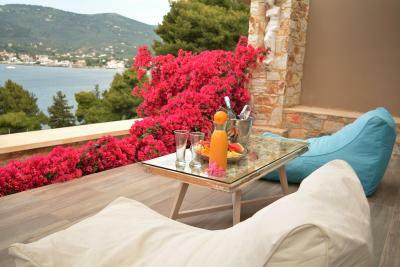 The location is really nice if you prefer a quiet spot on Skiathos. However, you can still hear the music from the bars in Skiathos at night across the bay if you sleep with your window open. 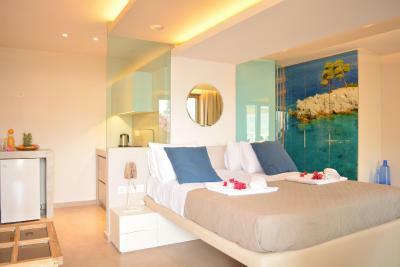 The standard is way above average Greek hotel standard. Excellent service, clean and new, very friendly management with great recommendations for excellent restaurants and beaches and things to see. Very impressed with my whole experience and will definitely be back. I highly recommend. 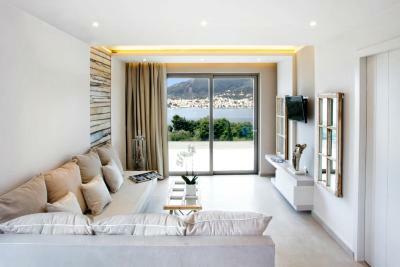 Beautiful suites in one of the most picturesque location ever to see. We have travelled all over the world and rank this as the best. Distance from Papadiamantis's house and Skiathos port are 1,1 Km away only if you are an eagle or a drone, approximate distance is 3-4 Km and definitely a car or a motorbike are needed. There is no WiFi available in the hotel (and never was) even though this is stated as one of the facilities which is totally unacceptable (especially for this price tag). There is no land line, thus no credit/debit card payments are possible through a POS. TV set was placed in an inconvenient angle making watching impossible while on the bed. Bathrooms were small (and one not fully functional) and taking a shower was easily creating a mess due to the lack of space and missing shower cabin. One day we had to have our breakfast at 9:00 am (availability hours were 8:30-10:30) and there was nothing available except from fruits. Hotel was understaffed, with only the owner/reservation responsible/manager and one cleaning lady who could not speak English or Greek! Fantastic view to Skiathos town. Really quiet thanks to the remote location. Hotel is very new, 2017 being actually its first fully operating season, thus the rooms are modern and in excellent condition. 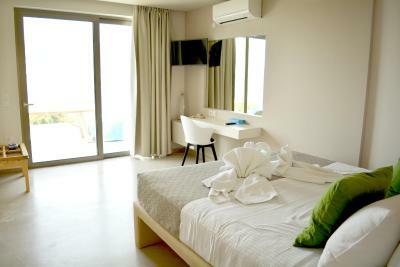 High quality of room amenities (towels, soap, etc.). Very helpful (though not experienced) owner/manager who was willing to make our stay a pleasant experience. Due to a technical problem in our initially booked room, we were moved to a very spacious suite with no extra cost. Breakfast quality and variety were good.